A niche area provided at PsychHealth Consultancy is the provision of private practice support and development. Karen has been providing workshops and individual consultations for psychologists building a private practice since 2007. 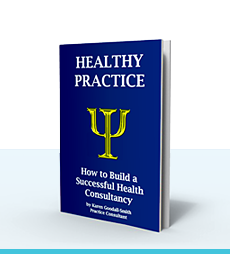 She has written the book, ‘Healthy Practice’ as a self-help manual for mental health professionals setting up or expanding a private practice. * Bulk billing or the recommended APS rate.